If you are not Catholic, but are interested in learning more, or if you used to be Catholic but you've been away, we hope the following resources will help answer your questions and guide you to the next step on your faith journey. Welcome! We are happy you are interested in learning about the Catholic faith. The Rite of Christian Initiation of Adults (RCIA) is a process by which men and women become members of the Catholic Church. It takes place within the context of the church community, and after a suitable period of formation, culminates in the reception of the sacraments of baptism, confirmation and Eucharist. We hope the following answers your initial questions. To hear from others who have been through the RCIA process, go to New Catholic Testimonials. You are always welcome to attend a Sunday Mass (worship service) at a Catholic church in your area. 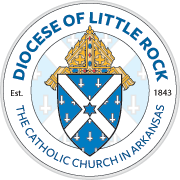 Go to the Arkansas Parish Directory to find a Catholic church in your area. Click on a parish to find directions, contact information and Mass schedule. We also offer the following resources to help explain the Catholic faith. We understand you may have drifted away as a teenager or while attending college. Or you may have married, divorced and now think you are excommunicated. You may have had an abortion and feel guilty and ashamed. Or you may have been offended in some way by a representative of the Church. Whatever the reason for leaving, we want to welcome you back. We know returning can be frightening. We want to remind you that the Catholic Church is made up of weak, sinful people, and we all rely on the mercy and forgiveness of a loving God. No matter how long you have been away, you are always welcome to return. To learn more, go to Rediscover the Catholic Faith or check out the following resources.